Description: This 9 piece wood mounted rubber stamp set is wonderful for all your card making ideas. Japanese theme with a mini black ink pad. Set by All Night Media. 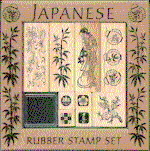 Size: Smallest Stamp is 3/4" x 5/8" and the Largest is 1" x 2 3/4"